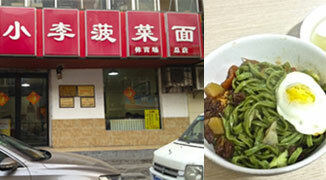 Xi’an is a treasure trove of small restaurants and hole-in-the-wall places. The only problem is, unless you’ve grown up here or hear from word of mouth, great spots you never even knew about are passing you by. So let’s start breaking this city down, starting with a walking tour of Xiao Zhai. Start your journey right before lunchtime, and hop on bus 12 at Zhong Lou (the Bell Tower). You will find the bus pick-up north of Zhong Lou, on the side of the street leading traffic into the roundabout. Get off on the third stop and continue walking in the direction of the bus for a few minutes until you see the first small street on your right. This road is called Tiyuchang Beilu and is filled with little shops offering a variety of foods. While I’m sure many of these family owned restaurants would be a great stop, my recommended lunch for your walking tour of Xiao Zhai is a little further down the road. The outside doesn’t appear to be much, only decorated with a large red sign that in Chinese characters reads Xiaoli Bocaimian, but the green spinach noodles which are their specialty are delicious. When you get inside, walk to the register and order the “Sanheyi” (three in one). You’ll then be asked whether you want the small (14 RMB) or large (15 RMB). I would consider the small a large sized portion, but since it’s only one kuai more you might as well get the large. Don’t miss out on the spinach noodles. When you’ve had your fill, return to the main road and head south. On your right you will see what at first might look like a giant parking lot, but at the back is Xi’an’s Tiyuchang stadium. Many international football matches have been played here and it is a sight to see on game day. Next to the stadium is the library. Feel free to wander in and have a look around. While you might not find much to read it is a nice change of atmosphere. Keep walking along the main road until you cross the second ring road. If you didn’t know already, the city is separated into three rings. The first ring is the city wall, and this looping freeway denotes the second. After you cross over the second ring you will pass a walking bridge. Coming up on your right is a wonderland of anything you could ever hope to barter for, known as Baihui. It’s a two story outdoor mall filled with a huge collection of different stores selling everything from stationary, clothes, accessories, musical instruments and machinery. Take your time to wander the halls and check out what the different stalls and stores have to offer. Even if you’re not in the mood to buy anything, the place itself has a fun vibe with each miniature store competing to play their store’s music the loudest. Once you’re done shopping, continue along the familiar road still southward. The first large street you see that you could turn right on (Xingshansi Xijie), just before the foot bridge has a very interesting temple on it, known as the Death Temple. While it’s not for the faint of heart, having detailed images of how people have been killed and punished in the past (think quartering and torture), it is an interesting, if out-of-the-norm place to visit. Also around this area you will start to notice the plethora of shopping available. Giant malls cover either side of the street, boasting familiar brand names (H&M, Vans, etc.) but there are also hidden markets. If you cross over the road bridge in front of McDonalds and walk into the large store area labeled Best Mart, a giant market of different stalls will greet you. The escalator down leads you to dozens of different boutique shops. Back up on the main road, but now on the other side of the street, you can keep walking south until you see a large reflective blue building. This is Saga, a mall new to the Xiao Zhai area. It has a diverse selection of nice Chinese brands and well-known Western ones. The sixth floor is entirely devoted to restaurants and has a selection ranging from Sichuan hot pot, Cantonese dim sum, Japanese sushi, American classics, to Korean BBQ. There is also a small frozen yogurt shop that is a nice treat. On the basement floor (B1) you can find the Western food market BLT which has a great range of foods at decent prices. At this point you can decide whether you’d rather have a nice sit down dinner in a restaurant on the previously mentioned sixth floor of Saga, or you can opt for something a little more adventurous. If adventure calls, cross the intersection continuing south once more until you come across what seems like a small alley just before the coffee shop called the Meeting Place. It’s about a five-minute walk from Saga mall. Turn down this little road and pick the restaurant that suites your fancy. My suggestion is Limin Chuancaiguan (利民川菜馆). In the evenings they do a nice kaorou (BBQ) and have just about every kind of homemade Chinese dish you could think of. So take your time and enjoy your meal. You can grab a coffee at the Meeting Place to wait until around 21:30 and then wander back down the road you came, towards the subway station (XiaoZhai). You’ll notice that the street has steadily become a night market. And with that, you can call it a day, head home to rest, proud that you now know a little more of Xi’an.